The Department of Business and Politics (DBP) strives to provide education of the highest quality within the Department’s field of research. We provide training at all levels in the CBS portfolio, from undergraduate to graduate and PhD levels. The Department also contributes to CBS’s executive education programmes, particularly MPA (Master of Public Administration) and MPG (Master of Public Governance). 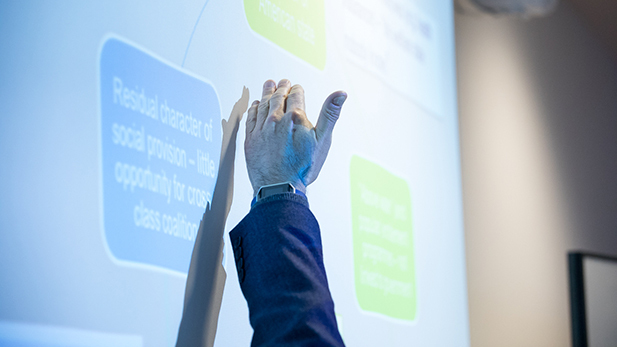 BSc in Business Administration and Sociology: The programme was developed by researchers at DBP, combining economics, economic sociology and organisational sociology to create an understanding of businesses in their social context from both economic and sociological angles. BSc/MSc in International Business and Politics: The programme is closely related to the Department's research profile with a focus on the interactions between businesses, national and international political institutions and non-governmental organisations, using theories and methods from business studies, economics, political science and international political economics. The Department of Business and Politics focuses on continuously maintaining and improving the staff’s educational skills through courses and peer coaching.